Enotah CASA, Inc. announced it will hold its inaugural Everyday Hero 5K and 10k Run on April 7th beginning at 8:00 AM. The timed event will begin at Hamilton Gardens, located at 96 Pavilion Rd, Hiawassee, GA and end at the Hiawassee Square. The course will provide scenic mountain and lake views perfect for the serious runner, families and everyone in between. 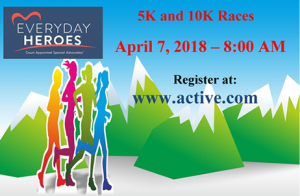 Afterwards, a post-race awards party is scheduled on the Square in Hiawassee including both awards for the run and presentation of the Everyday Hero Service awards for Towns & Union Counties. Enotah CASA (Court Appointed Special Advocate) program believes every abused/neglected child needs a hero. And its history shows it is the everyday hero, like you, whose advocacy and caring can help change the life of an abused/neglected child. Therefore, the theme is the Everyday Hero. In addition to awards for top male and female runners, there will be an award for each age category. The CASA Everyday Hero Run raises much needed funding used to train volunteer child advocates who become the voice of an abused and/or neglected child in juvenile court proceedings. The primary goals Enotah CASA are to recruit, screen, train and supervise volunteers to advocate for the best interests of abused or neglected children and to ensure the quality of volunteer advocacy for the children we serve. Each year it costs approximately $1,200 to serve one child through the CASA program and approximately $400 to train each volunteer advocate. In 2017, 68 CASA volunteers advocated for more than 291 children from the Enotah Judicial Circuit and 141 abused/neglected kids from Towns & Union Counties. Entry fees for the Everyday Hero Run are $30 for adults & $15 for children before March 23, 2018. The fee includes a collectible t-shirt, food and the post-race party. Participants may also sign up as teams with five or more runners. A registration booth is to be open 7:00 to 7:45 AM. race day at Hamilton Gardens. Race packets can be picked up there. For Team Registration & Rules – Click Here. To find out how to Sponsor This Event – Click Here.